I made this Queen Elsa cake for my granddaughter. I used the Wilton doll pan and added extra batter to make the dress bigger. 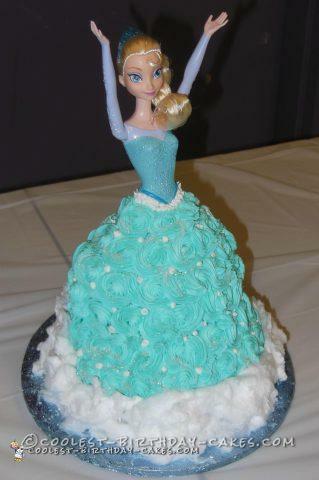 I then used a full sized Elsa doll to create what my 5 year old granddaughter called the BEST cake EVER! I love experimenting with the doll cakes and for this one I made the bottom of her dress out of cotton candy to imitate the snow and make her look more regal instead of icing the entire cake.